John Cowan Hartford was an American folk, country and bluegrass composer and musician known for his mastery of the fiddle and banjo. John Hartford remains best known for the country-pop standard Gentle on My Mind, a major hit for Glen Campbell and subsequently covered by vocalists ranging from Frank Sinatra to Aretha Franklin. The song remains among the most often recorded in the history of popular music, its copyright netting Hartford well over a hundred thousand dollars annually for many years. But there was more to Hartford than that curious mix of highly literary folk music and MOR romantic nostalgia, told from the perspective of a homeless man remembering days of perfect love. Hartford was a multi-talented old-time musician, a riverboat captain, a satirical songwriter, a one-man showman of exceptional talents, and one of the founders of both progressive country music and old-time string music revivalism. John Harford was born in New York City to a medical resident and his painter wife but grew up in St. Louis near the Mississippi River he would always love. His first job, on a riverboat, came at age ten. As a boy he liked the traditional country music he heard on the Grand Ole Opry radio broadcast from Nashville, and by age 13 he was an accomplished fiddler and five-string banjo player whose main influences were Stringbean and Earl Scruggs. Soon he added guitar and mandolin to his repertoire. He founded his first bluegrass band in high school and dropped out of Washington University after a year to pursue his music. Performing and working as a DJ and sometimes as a commercial graphic artist in Missouri and Illinois, Hartford made a few singles for small local labels in the early '60s. In 1965 he moved with his wife and son Jamie to Nashville, taking a DJ job at radio station WSIX. It didn't take him long to meet the other architects of the city's songwriting renaissance -- Kris Kristofferson, Mickey Newbury, and the Glaser Brothers, who owned a state-of-the-art recording studio and began promoting Hartford and his songs around Music Row. Signed to RCA in 1966, Hartford went into the studio to record his debut album, John Hartford Looks at Life, which was produced by Atkins. "He is himself and will not be told how to write or sing, because he has only his own world," wrote Johnny Cash in the liner notes. Hartford's second album, Earthwords & Music, featured "Gentle on My Mind" (a modest hit) along with songs that pointed forward to his independent-minded career as a solo performer: "The Good Old Electric Washing Machine Circa 1943" featured a charming mouth-music imitation of that appliance. In 1968 Hartford moved to Los Angeles, appearing regularly on CBS's Smothers Brothers Comedy Hour and later on The Glen Campbell Goodtime Hour. He also played on the Byrds' 1968 album Sweetheart of the Rodeo and Doug Dillard's The Banjo Album. By the end of the decade, Hartford also earned his riverboat pilot's license. Financially secure thanks to "Gentle on My Mind," he decided to spend the rest of his life pursuing an artistic vision rooted in country music traditions. In 1971, Hartford returned to Nashville and founded a bluegrass band featuring guitarist Norman Blake, dobro player Tut Taylor, and master fiddler Vassar Clements. The all-acoustic Aereo-Plain album recorded for Warner Bros. that year (and its successor Morning Bugle) featured a free bluegrass feel often cited as seminal both by progressive bluegrass musicians and by adherents of the modern jam band movement. Hartford made guest appearances on albums by James Taylor, Seals & Crofts, and Hoyt Axton, and he cut the bluegrass Tennessee Jubilee album in 1975 with the assistance of Benny Martin and Lester Flatt. In the mid-'70s Hartford worked out a solo act in which he appeared in a trademark bowler hat and black vest. He began to record unaccompanied, releasing the unclassifiable Mark Twang in 1976 and winning a Grammy award for Best Ethnic or Traditional Recording. That album was the first of a series of mostly solo albums Hartford recorded for the Chicago-based Flying Fish label, featuring a mix of traditional material with Hartford's own trenchant originals. Though Hartford had diverged sharply from the sphere of commercial country music, he continued to live in Nashville and to appear as a session man on such albums as the Dillards' Permanent Wave and Shel Silverstein's The Great Conch Train Robbery. He also became involved with Opryland, where he helped launch an old-fashioned steamboat ride. By the late '80s Hartford was battling non-Hodgkin's lymphoma, but he continued to record and perform until he lost the use of his hands shortly before his death in 2001. He performed and recorded with his son Jamie, re-recorded and reissued his earlier work on his own Small Dog Barking label, and kept busy with a host of side projects such as narration for the Ken Burns public-television series The Civil War. His later albums, several of them recorded for Rounder, were highly individualistic gems: 1998's Speed of the Old Long Bow was a tribute to a little-known fiddler named Ed Haley on which Hartford not only performed Haley's music but also added lyrics that traced his life and career. As word of Hartford's illness spread, his well-wishers included a long parade of musicians he had worked with and influenced profoundly. 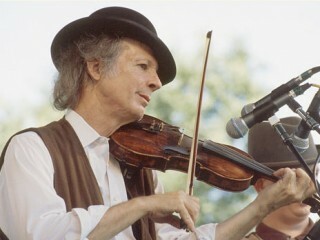 View the full website biography of John Hartford.